Pacifica’s Public Works Department officials said on Thursday their crews will keep a close watch on the coast bluffs as a storm front heads to the coastal town, where cliffs crumbled and apartments were red-tagged, and later demolished. For now, Raymond Biagnini, field services manager of the Public Works Department, is simply warning residents and visitors to be mindful that the Earth could cave in if and when the rains come down hard like they did last winter. He advised that people be aware of their surroundings along the coastal bluffs. “Obviously turning your back to the ocean is not a good idea,” he said. 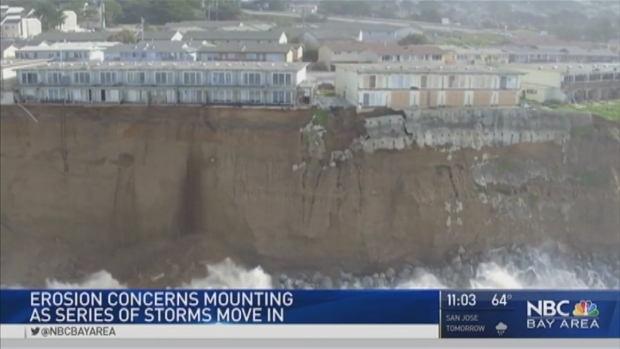 Last winter, the El Nino storms causes the coastal bluffs to crumble along Esplanade Drive, forcing apartment dwellers to evacuate and their homes to be destroyed. 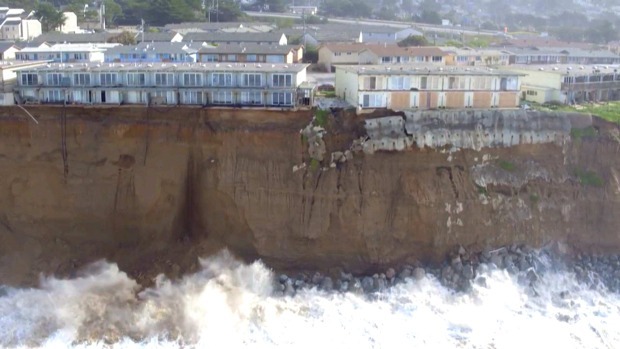 Pacifica officials are keeping a close watch on the coast bluffs as a storm front heads to the coastal town, where cliffs crumbled and apartments were red-tagged, and later demolished. Rick Boone reports. According to City Manager Lori Tinfow, the complexes at 320 and 330 Esplanade Avenue have been demolished. A building at 310 Esplanade remains standing, but is unoccupied after being deemed uninhabitable. "We have been monitoring the property along the 300 block of Esplanade Avenue on a weekly basis and during the last storm and this one, that monitoring increases to daily," Tinfow said. "So far, there has been no change in the bluff’s status." Now, the city has applied for a state grant to help pay for work to "stabilize the bluff edge," Tinfow said, adding, "Our concern is protecting the street and the utilities within the street." Earlier in October,contractors completed repairs to one section of the promenade, which was damaged by last year’s El Nino storms. Repairs to that and part of the sea wall are expected to be done in about a month, according to Tinfow. Monday evening, the City Council voted unanimously to go ahead on 12 repair projects, with a price tag of $3.3 million. Approximately $2.64 million will come from insurance coverage and grant funding, and the balance will come from city funds, according to Tinfow. The total does not include replacing the northern section of the sea wall, damaged during last year’s El Nino. At this time, the city does not have cost estimates or a timeline for the new section. Officials are in talks with the U.S. Army Corp of Engineers to help design and fund the replacement section, originally built in 1984. Pacifica residents are happy to see city leaders stepping in to help. "They've been taking care of business," Basil Boyer said. "They put a new wall up ... and this is kept clean after the storm." Meanwhile, the rain has forced homeowners in Linda Mar to begin stacking sandbags to protect property. Lola Carrington said the street on which she lives is prone to flooding. She is worried because she doesn't know when her block will turn into a lake again -- whicih is what happened to her neighbors. "They had water in their house about four feet up on their drywall," she said. "It can get ugly." The city is offering free sandbags at Fire Station No. 2 at 1100 Linda Mar Boulevard. It is open 24 hours. In less than 48 hours, Pacifica's tranquil waves could top 15 feet as the first rainfall of the season soaks the Bay Area. That's not so swell, however, for people who live on the city's quickly eroding cliffs.